Given the current political situation and developments in Algeria, a look into the history of the Muslim Brotherhood in the country seems necessary, especially with the birth anniversary of the found of Hamas in Algeria, Mahfoud Nahnah, and as Islamist Abderrazak Makri was announced a presidential candidate. Nahnah was born in Blida in 1942 and except for him, the Muslim Brotherhood would not have existed in Algeria, as he kept on spreading Muslim Brotherhood ideologies and thoughts amongst students and used to organize seminar around the university campus, which often hosted students and professors who believe in the ideology of MB founder Hassan al-Banna. 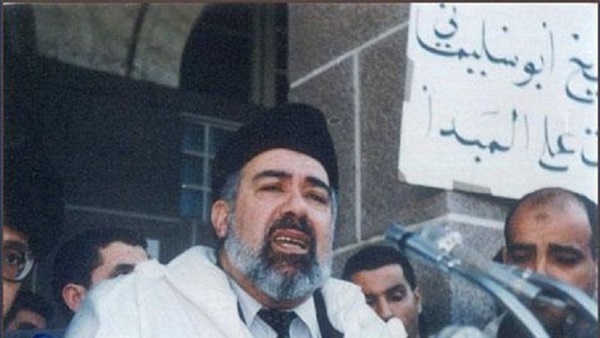 With the help of his friend Sheikh Mohamed Bouslimani, Nahnah founded the first Islamist group in Algeria under the title of Al-Muwahhidun, which most attracted the poor as the group took advantage of the deterioration in economic and social aspects to promote for itself. Moreover, in 1976, Nahnah pledged allegiance to the Muslim Brotherhood after announcing opposition to the National Charter of that year. From 1976 to 1980, Nahnah was in prison for participating in acts of sabotage. Also, there was a struggle to create an official representation for the Muslim Brotherhood in Algeria. In 1989, a Salafist group was formed under the name the “Islamic Salvation Front” (FIS), which was headed by Abbassi Madani, and formed a political party to run in the legislative election that took place Dec. 26, 1991 and was declared official less than a year later after it received more than half of valid votes cast by Algerians. On 6 December 1990, after the FIS was successful in local elections, Nahnah established his own party and called it Hamas, which later got renamed Movement of Society for Peace, or MSP. By the end of 1992 in Algeria, elections had been suspended, and the main opposition party, FIS, got disbanded after Bendjedid resigned as the military demanded him to, in order to save the country. Thus, the FIS deemed this as a military coup, however, Nahnah stood by the army, which sparked the Algerian Civil War between the government and various Islamic rebel groups that resulted fatalities of around 200,000 people. In Nov. 1995 Nahnah ran for president and finished second to General Liamine Zeroual with about 25% of the vote and attempted to try again in 1999 but was disqualified by the courts. Nahnah died of leukemia on June 19, 2003 at the age of 61 in Paris.